Preheat the broiler. In a bowl, stir together the chopped orange, olive oil and DOC CALYPSO to taste. 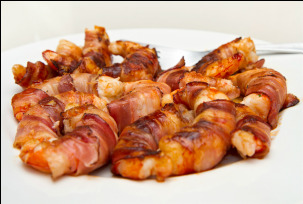 Wrap each shrimp in a section of bacon and secure with a toothpick. Put the shrimp on a baking sheet and broil, turning once, until the bacon is crisp and the shrimp is cooked through, 2 to 3 minutes each side. Remove the toothpick from 1 of the cooked shrimp and center the shrimp on a serving platter. Spoon a little of the leftover citrus & DOC CALYPSO mixture to finish! Delicious!